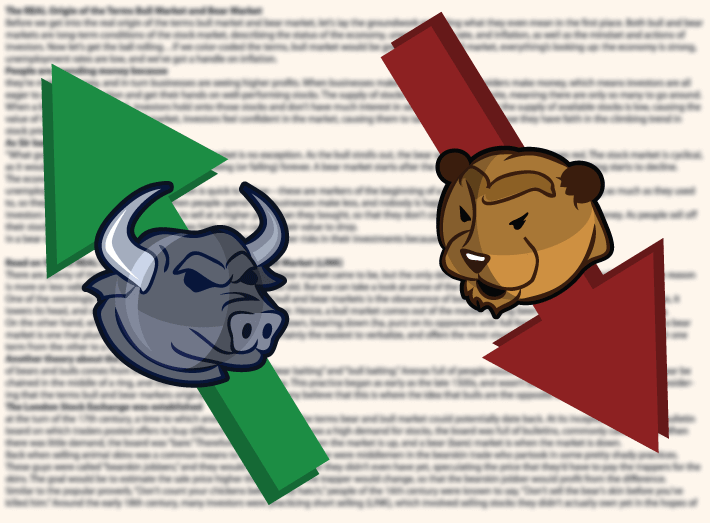 What Does "Bull and Bear Market" Mean? If we color-coded the terms, bull market would be green. During a bull market, everything’s looking up: the economy is strong, unemployment rates are low, and we’ve got a handle on inflation. People are spending money because they’re making money, and in turn businesses are seeing higher profits. When businesses make money, their shareholders make money, which means investors are all eager to get in on the action and get their hands on well-performing stocks. The supply of stocks in any company is finite, meaning there are only so many to go around. When a business is doing well, investors hold onto those stocks and don’t have much interest in selling. This means that the supply of available stocks is low, causing the value of the stocks to rise. In a bull market, investors feel confident in the market, causing them to take greater risks because they have faith in the climbing trend in stock prices. As Sir Isaac Newton once said, “What goes up, must come down,” and the stock market is no exception. As the bull strolls out, the bear saunters in, and the market goes red. The stock market is cyclical, as it would be impossible for it to simply keep climbing (or falling) forever. A bear market starts after the climax of the bull market, and everything starts to decline. The economy enters a recession, unemployment rates rise rapidly, and inflation is quick to follow—these are markers of the beginning of a bear market. Consumers aren’t making as much as they used to, so they have to start spending less. When people spend less, businesses make less, and nobody is happy. Investors start selling their stocks, hoping to sell at a higher price than they bought, so that they don’t come out of the investment having lost money. As people sell off their stocks, the availability of stocks becomes high, which causes their value to drop. In a bear market, investors lose faith in the market, and they take fewer risks in their investments because they fear the financial repercussions.